The best way to introduce utensils to your baby is through exposure from the very beginning of BLW / solids (if not beforehand!). Exposure means giving him opportunities to hold, play with and use utensils. Embrace the mess and let him explore and have fun. :) It is also crucial to teach by example, allowing him to observe you, other family members and meal companions using utensils at social meals. Initially, we loaded a spoon with peanut butter, oatmeal, yogurt or hummus and put it on Theo’s tray. He then tried to pick it up and get the food into his mouth. It took some practice, but it was amazing to watch him figure it out! He quickly learned how to turn the spoon over using both hands and put it in his mouth upside down so that he could scrape the food off with his lips and gums (and later teeth). Babies are incredibly resourceful, especially when given the chance to problem-solve on their own. Indeed, Theo has managed to get food into his mouth from a spoon or fork at a lot of surprising angles. In addition to putting a loaded spoon on Theo's tray, we sometimes handed it to him. He took it in his hand(s) and figured out to get the food in his mouth. Personally, I think the latter is best, as it requires more use of your baby’s skills and dexterity and thus further encourages his independence and confidence. Handing him the spoon directly doesn't give him a chance to learn how to pick it up off of the tray on his own - or to feel good about doing it himself! At times when I was okay with a bit more mess, I gave Theo yogurt, applesauce, oatmeal or any other mushy food in a suction bowl for him to “dip” his spoon. Mostly, this approach involved him tapping and hitting his spoon into the bowl and then sometimes licking food off of it. He often just reached into the bowl with his hand because it was more efficient. It was very messy and fun to watch! We have used all of the same techniques, for lack of a better word, with forks as well. After many months of watching us eat and practicing with his own utensils, Theo (12 months old) now tries to imitate us by dipping / stabbing his fork or spoon into food on his tray. Although his overall success rate is rather low, he certainly enjoys practicing and is quite determined to figure it out. In fact, in just the past few days, he has succeeded in getting various pieces of food, including asparagus and sausage, onto his fork. He has managed to keep each piece on it and get it (mostly) into his mouth! Very impressive. He is still exploring and figuring out the mechanics of the whole process, and I know he will continue to hone his skills. Success eating asparagus with a fork (12 months)! That being said, keep in mind that it will be a very long time before he fully masters this skill. According to Baby Center, "Some toddlers start wanting to use utensils as early as 13 months, and most children have figured out this all-important skill by 17 or 18 months. By age 4, your child will probably be able to hold utensils like an adult and be ready to learn table manners." This set was our first set of spoons, which I believe, given its long handle, is really for feeding purées to a baby. They were fine for the first few months of BLW (months 6 and 7) and then we moved on to these spoons and forks. While we still use these, we have also upgraded to some toddler utensils. This fork and spoon are designed for "little hands" for babies 12+ months. 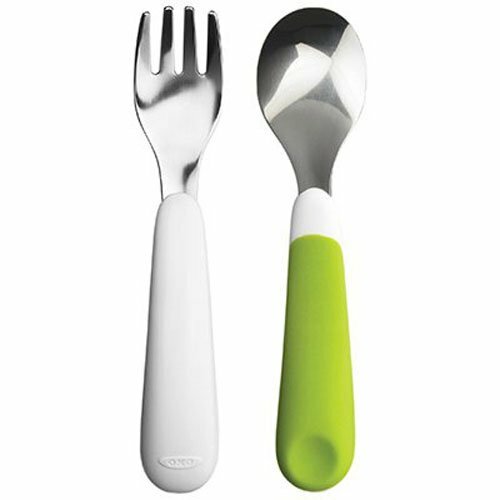 They're intended to mimic adult utensils, but they have a no-slip, more ergonomic handle that makes them easier to hold. These toddler spoons are also great because the angled handle is ergonomic. The little holes in the spoon help to prevent food from falling off. Honestly, I wish my spoons were like these! So far, Theo loves using them. A few other utensils / brands recommended by my mommy and me teacher at Babygroup include Num Num Dips, which are a kind of training spoon, and Oogaa, which is a line of silicone feeding products for babies and kids. Additionally, other moms from other Babygroup classes have recommended the utensils below. 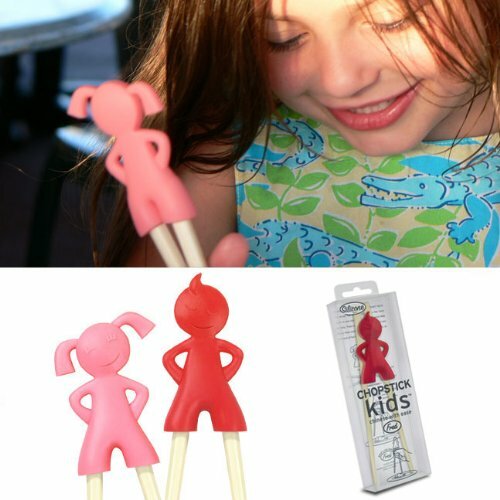 Although we haven't used any personally, they look great and seem like a fun way to make mealtimes and using utensils even more enticing. They are most appropriate for early toddlers, ages 12-15 months. After further research online, I discovered that Fred and Friends has so many other fun options! This set comes as a bunny and carrot (nesting), rockets and a plane! Clockwise from upper lefthand corner: Oxo Tot Training Spoon and Fork are great for young toddlers; Sassy Less Mess Toddler Spoons are awesome spoons for young toddlers; Beaba spoons are a good option for early practice with utensils; Fred and Friends chopstick holders; Lego utensils and a Souper Spoon can make mealtimes fun! What has your experience been with utensils with your baby or toddler? What are some of your favorite utensils for your baby or toddler? Please share your experiences and recommendations with us in the comments below or in a private message sent through the Contact page!